(optional) anesthetic or tranquilizer: do not use narcotic drugs, acceptable drugs include xylazine, propofol, barbiturates or inhalant gas anesthesia. The dog is positioned in sternal or lateral recumbency. 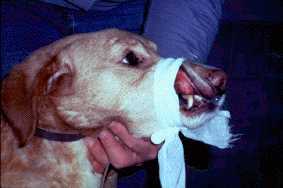 The upper lip is everted and secured using a strip of gauze wrapped snugly around the muzzle. The template device is placed on the buccal mucosa and triggered as the timer or stopwatch is started. Simplate incisions are made parallel and Surgicutt incision is made perpendicular to the lip margin. Blood flow from the incision(s) is blotted using filter paper held directly below, but not touching the wounds. The time from triggering the device until blood no longer appears on the paper is recorded as the bleeding time. 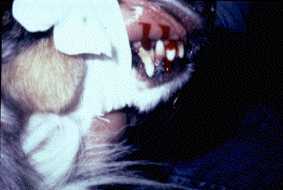 The muzzle gauze is removed and pressure applied to the wounds until active bleeding ceases. If needed, topical tissue adhesive (cyanoacrylate) can be applied to prevent rebleeding. Lip bleeding time is expected to be prolonged in patients with severe acquired or inherited platelet dysfunction or severe von Willebrand disease. There is a variable response in dogs with DIC or mild forms of vWD. Dogs with even severe coagulation factor deficiencies usually have normal lip bleeding time. The upper lip is everted and held in place with muzzle gauze that encircles the upper and lower jaw. The gauze must be tied snugly. The buccal bleeding time is not inherently painful, but dogs must remain quiet and in position for up to 10 to 12 minutes. Sedation may be required for adequate restraint. The Simplate device is triggered parallel to the lip margin. Blood flowing from the wounds is then gently blotted below the incisions. Do not wipe or disturb the wounds. The time from incision to cessation of blood flow is recorded as the buccal mucosal bleeding time. The dog is positioned in lateral recumbency. Remove any hair that covers the nails. The guillotine clipper is used to sever the apex of the nail cuticle. A clean transection of the nail is made just into the quick, to produce a free flow of blood. An arterial pulse indicates that the cut was too high, and only two or three drops of blood means the cut was too low. Several nails can be cut at one time to ensure appropriate technique. A stopwatch is started simultaneously with the cut, and the nail is left to bleed freely. The time until bleeding stops is recorded as the bleeding time. The nail is cauterized with silver nitrate sticks to prevent rebleeding. Toenail bleeding time is expected to be prolonged in patients with acquired or inherited platelet dysfunction, coagulation factor deficiency, severe von Willebrand disease, or the hemorrhagic phase of DIC. The nail cuticle is exposed. Cuticle bleeding time can be performed simultaneously on several nails. 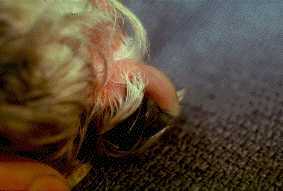 The cuticle bleeding time wound is painful, dogs should be sedated or anesthetized for this procedure. Transection at appropriate site for steady flow from the cuticle. Discrete drops of blood should fall from the wound for at least the first 30 to 60 seconds after transection. A steady stream or arterial pulse indicates that the wound is too far into the cuticle. That nail should be cauterized and the test repeated using a different nail. Thrombosis and Haemostasis 1993; 70:777-80.